INDULGENT ADVENTURES - Travel, adventure and windswept dreams. Home » Australia » EASTER ROADTRIP: Sydney to Dinner Plain, High Country, Victoria. EASTER ROADTRIP: Sydney to Dinner Plain, High Country, Victoria. Dinner Plain, High Country Victoria, Australia. It was a long drive down from Sydney to the NSW/ Victoria border town of Corowa on Easter Friday. 7 hours all up with bumper to bumper traffic getting out of Sydney along the Hume Highway to the Picton turn off (where we finally lost the coastal traffic) and could seriously cruise at 100plus and eat up the 600 plus km’s. Past Goulburn, then the Canberra turnoff and then Yass. A refuel stop at the Dog on the Tucker Box outside of Gundagai – hummm… an icon lost amongst a sad takeaway and fuel stop, Surely as a kid it was far more exciting? Even the grey brigade on tour from Newcastle were underwhelmed by the Dog and very happy for the convenience of the toilets! Anyway onwards we go after a mandatory photo of said dog to Albury Wodonga and the turn off to Corowa. We had selected an overnight stay at Corowa’s Best Western Heritage Motel. We had tried to get a room in Rutherglen, but a one night booking on Good Friday was not to be had. The Best Western Heritage is a very very country motel, our room featuring two double beds (one comfy, the other hard and lumpy). We expected it to be a standard 4 star country motel for a short stopover and so it proved. A clean and comfortable room was presented at a reasonable cost. It was located in a quiet location within walking distance to the main street. Perfect. Not having prebooked dinner anywhere was a mistake on Good Friday. So it was off for to the local RSL for an quintessentially Australian experience. A very popular choice with the locals and the bistro was doing a great trade. We were happily surprised by the quality of the bistro. While no culinary awards would be won, it was good comforting country tucker. A good cheap start to the holiday. Sadly though the RSL had no Coopers.The barmaid hadn’t even heard of it – ‘Is that some kind of cider?”. They live a sheltered life in the country! That said, they did have the last bottles of Cofield’s excellent Pinot Grigio left in the district, and for a very reasonable price. A happy ending! Corowa was much larger than I had expected but it still reflected its colonial past with a wide main street and Federation facades on many of the shops and hotels. Known as the town where Australian Federation was birthed, the actual township owed its early development to the mighty Murray River on which it sits and a couple of astute early pioneers. The old bridge at Corowa (John Foord bridge, c.1892) built to cross the Murray River from New South Wales to the opposite Victorian town of Wahgunyah is still travelled today. We crossed it early Saturday morning on our way to Rutherglen and some of the excellent wineries in the area. A short but productive visit to stock up on the local produce for our stay in Dinner Plain. We couldn’t pass up the opportunity to visit Cofield Wine’s after the Pinot Grigio the night prior. Cofield have an onsite Café, ‘The Pickled Sisters Café’ for a delightful Brunch in the sun. We enjoyed soaking in the early Autumn colours and the mild weather showing off the qualities of the region to its best. Food wise the scrambled eggs with smoked salmon on toast was the pick, but for the stout of heart, the French toast with Milawa Cheese, Bacon & Tomato relish will have your arteries in need of a good Cofield Durif,…and with the cellar door right next door, it was a very pleasant tasting indeed. 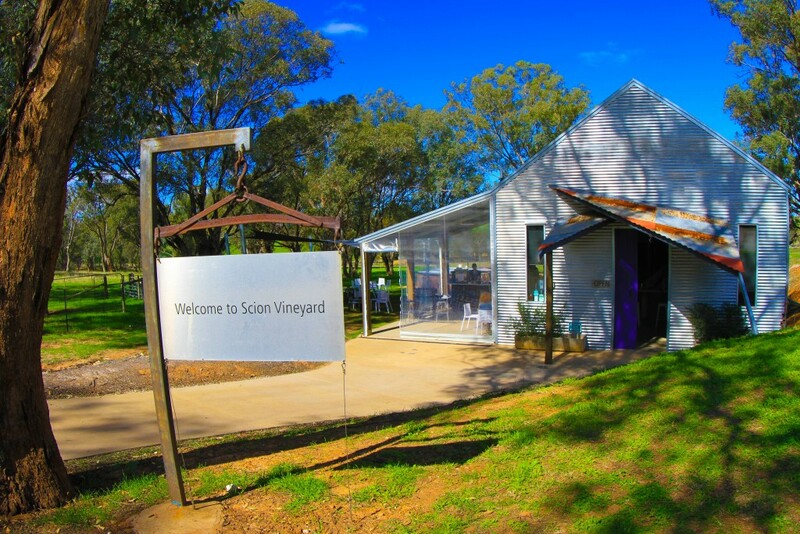 Scion Winery, Rutherglen, Victoria, Australia. Not wanting to waste time we quickly changed plans to Rutherglen and Scion Winery, recommended by our dear friend’s Kate and Tan. A delightful family run winery, we enjoyed our chat with winemaker Rowly Milhinch and his mother Jan as we sipped our way through their offerings. We stocked up on the easy drinking Fleur 2013, an off-dry floral white Muscat. The viognier and the Durif’s were enjoyable but for us it was the Muscat’s that were the star of the show. The luscious ‘After Dark’, 2012 and ‘The Rose Muscat’ 2012 simple delightful. At the time of writing supplies are quickly diminishing! Highly recommended, we had a lovely time. Next we visited the town of Rutherglen. The main street exuded old world charm. I want to go back and stay as it had an irreplacible historic feel. All was not well at Rutherglen’s one butcher though…an influx of tourists has snapped up all the lamb! – no lamb anything! Easter Sunday’s dinner was looking precarious! Things improved when I found a tiny lamb leg hidden under other cuts of meat in the local IGA – truly the last leg of lamb in Rutherglen! Our Easter Sunday dinner was saved! We also fought the crowds at Parker’s Pies (the best pies in Australia!) to stock up for Dinner Plain. Then we headed out of town in search of Vintara Winery on another recommendation. Google maps had a little trouble finding Vintara. Google dumped us in the middle of nowhere on a dirt road surrounded by paddocks. Street view accurately showed the paddocks, so they’d actually been there!! ..What the? Eventually we found the right place, but with a new name, a new owner, a new everything (as the guy running the tastings said). So we changed our mind on food, bought a couple of the last Vintara bottles, and moved on. Lunch plan B was Chiltern, a village known for its historic street frontages between Rutherglen and Beechworth. Historic it was and like stepping back in time as it was utterly deserted, with no one in the eateries, only the lone cowboy prowling the street looking in shop windows. We bought a coffee and moved on. The drive from Beechworth to Dinner Plain was both gorgeous in a picture perfect Autumn environment and spectacular as we began the ascent into the High Country. All of the little towns were very pretty, and everything was green, gold, and orange with some of the trees just starting to turn. Then we hit the mountains and started to climb. Ten km’s of switchbacks up the mountain, and about 500 m of Armco rails. I’d hate to do that trip in winter. Or with a caravan. It was slow going but you are rewarded with gorgeous views of National Park. With the ascent the sky quickly changed from blue to grey and the temperature dropped from a balmy 20 degrees to 2 degrees! Burrrr!!!. Finally we over the top at Mt Hotham at 1860m and across to our destination, Dinner Plain. Dinner Plain is a cute little village developed primarily as a ski resort, set in amongst the snow gums. 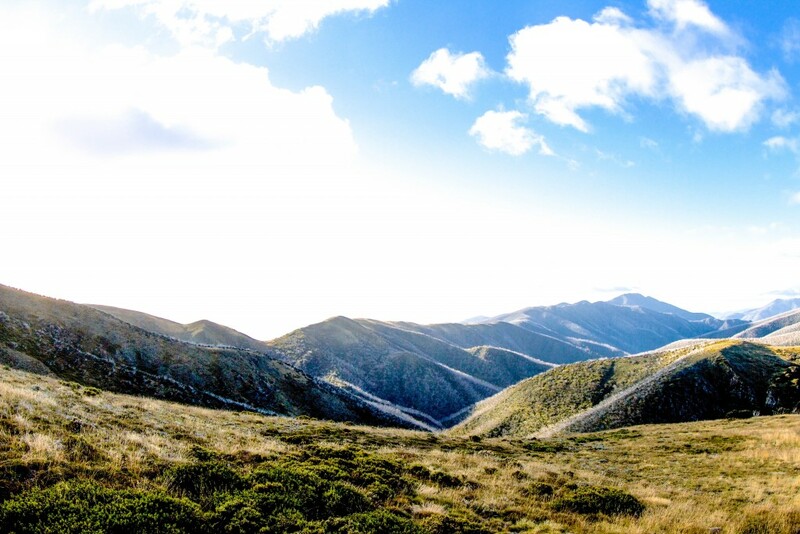 It is an ideal base to do some High Country walks, mountain biking or horse riding out of season and in season well its skiing, snowboarding, toboganing or just enjoying the scenery! We had arranged to rent a 2 bed self contained terrace at a fraction of the winter rate which at Easter represented a very good value experience. With two bedrooms and two bathrooms over three levels to sleep up to 6, It also had a very comfortable lounge dining and open plan kitchen, full laundry facilities and a dry room. While the Terrace had central heating and it was needed at that time of the year, we were also able to enjoy the slow combustion fire, which made a lovely cosy atmosphere – particularly for a superb lamb roast Easter dinner. Wood was provided with the barest number of firelighters, minimum kindling and an axe! (Splitting the wood for the kindling was fun and an essential activity!! not to mention very colonial). Note to all – BYO firelighters! The only negative about the property was the queen bed in the Master bedroom was hard as a rock and needed softening with spare doonas! We had dinner at Peppers Rundall Lodge Graze Restaurant on the Saturday evening. The restaurant had a rustic but formal atmosphere and featured a big log fire. The service was more hotel than formal dining experience. The menu featured some local produce. We tried the cured venison carpaccio, the Kingfish cerviche, the duck pie, and the local Harrietville trout fillets. The duck pie was sensational. We went back two nights later to retest and it was very quiet as the Easter crowds had moved on. We had the scallop soup, which was lovely, the courgette flowers, and the risotto which was nice and the duck pie again, which wasn’t quite as good as the previous visit disappointingly. We also tried two desserts – the hazelnut chocolate mousse and a sweet potato Brulee. I love my chocolate mousse but sadly I couldn’t recommend either dessert. On the way to dinner we had bumped into Craig (Thompson?) the captain of the Cuff and Collar Polo Team walking home from the pub with his mate. 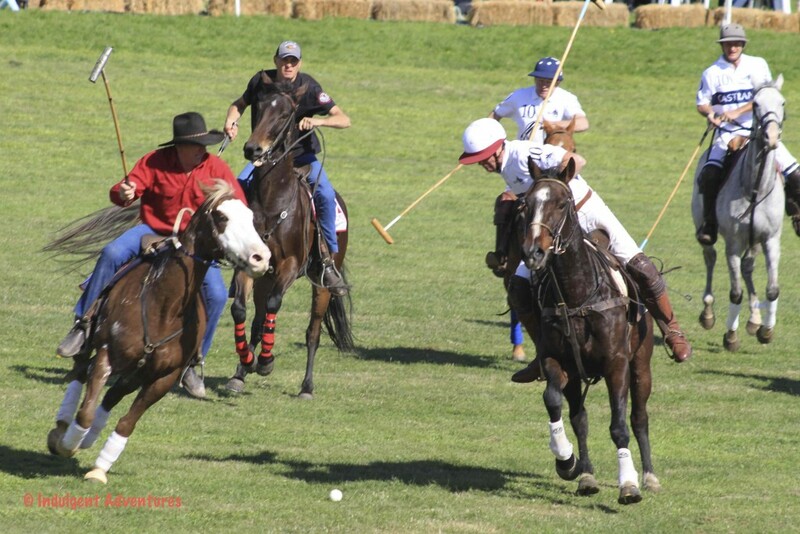 We were granted a brief insight into the running of the famous Geebung Polo match we were to view on the morrow. 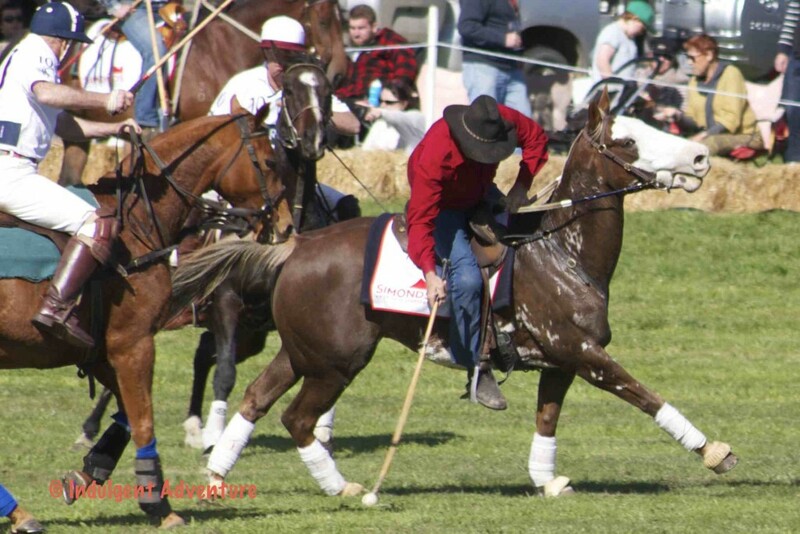 Geebung Polo Match Cuff v Colars, Dinner Plain, Victoria, Australia. Easter Sunday was an icy 4 degrees so we donned our woollens to head out to the Polo match. 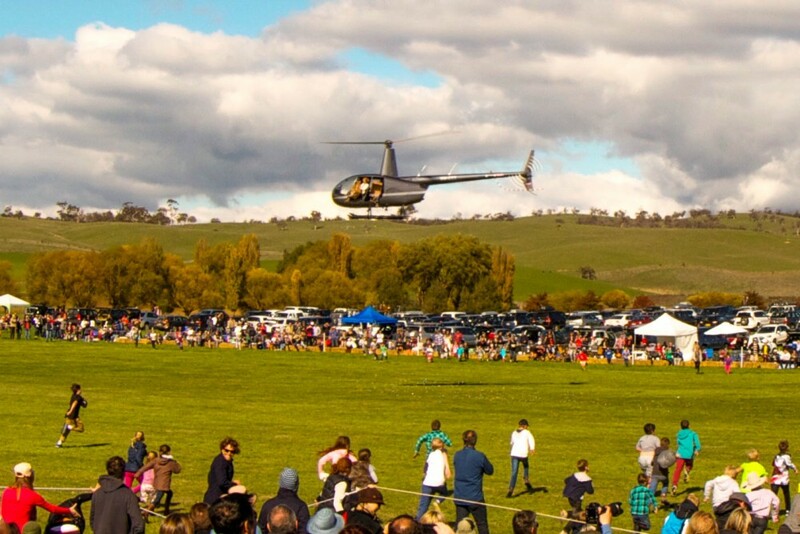 We got there at just the right time – had a cappucino, watched a couple of chukka’s, then the famous helicopter Easter Egg drop on the Polo field. Picked up an Easter egg (or three) the hordes of kids had missed, and beat the traffic back to Dinner Plain. A great country event with a country fair atmosphere and highly recommended! The kids will have you going back year after year! Geebung Polo Club Helicopter Easter Egg Drop, Dinner Plain, Victoria, Australia. When we got back, we had enough time to do a circuit walk around Dinner Plain enjoying the snow gum woodlands. I will admit though, that at the end of the walk we hurried back to our fire, as we nearly froze our ears and noses off! It was freezing! High Country Walking, Dinner Plain, Victoria, Australia. 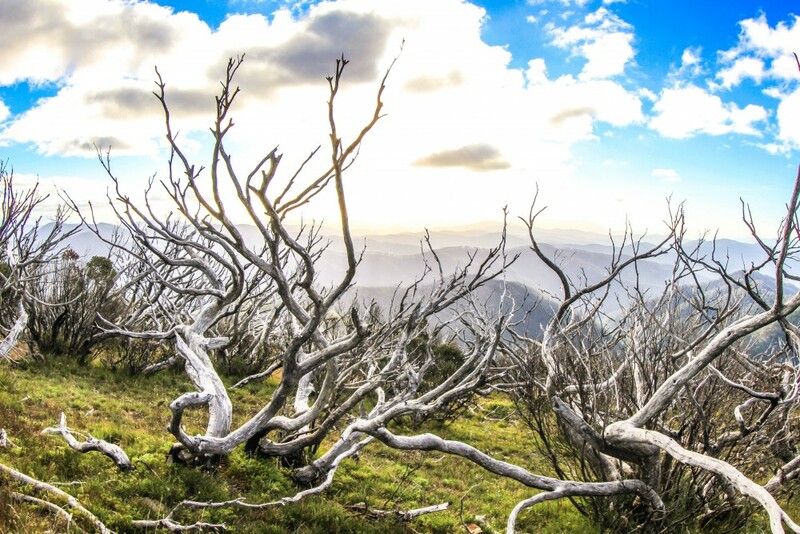 There are many walks that can be done from Dinner Plain from easy to very difficult. Regardless of the time of the year warm windproof gear is a must, as is wearing proper hiking boots and taking an appropriate amount of water and snacks. We did the Precipice Pass walk with a detour to Carmichael Falls. 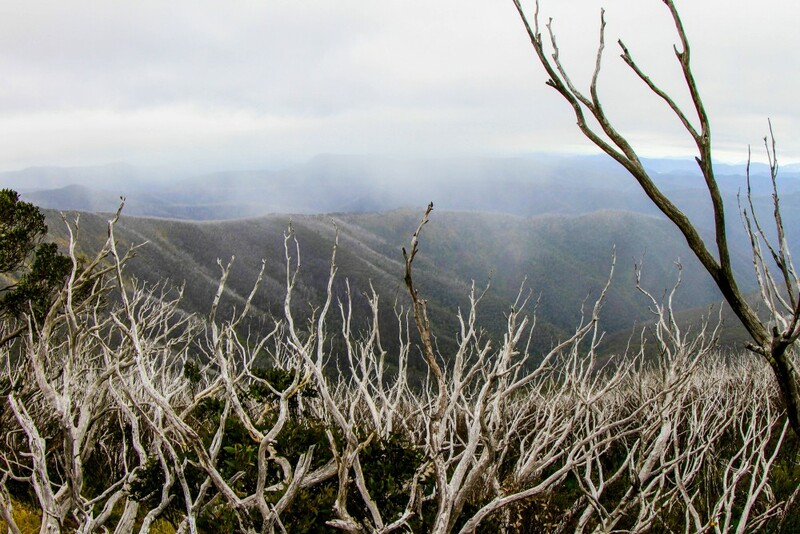 The walk was fairly flat and easy and gave good views of the Dargo catchment and views to Mt Tabletop. (9km return). We also did part of the more challenging Cobrunga Ditch Walking Track, which follows the course of an abandoned gold mine water race. 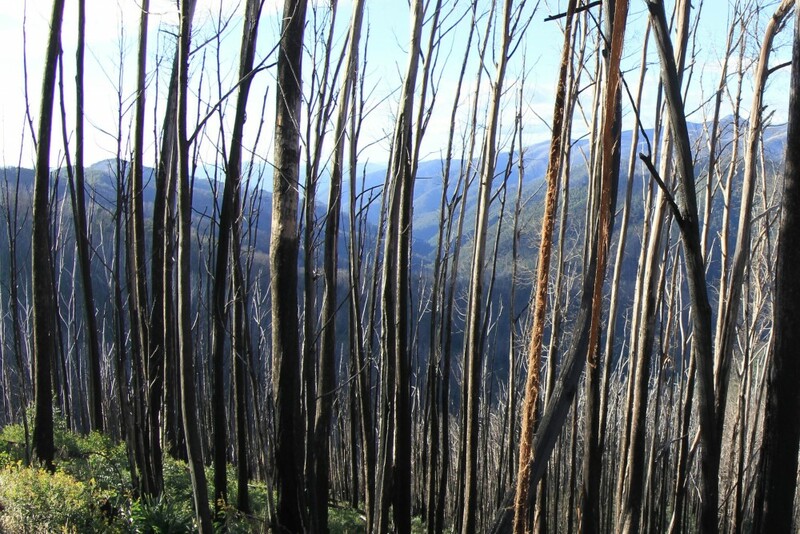 The walk provides an amazing insight to the environmental conditions which confronted our early gold prospectors and settlers. Walking the country where they worked and lived gave me an immense sense of pride – this is hard country! 12.5km one way, 18 km return circuit. Other walks that sounded interesting had we more time were the Mt. 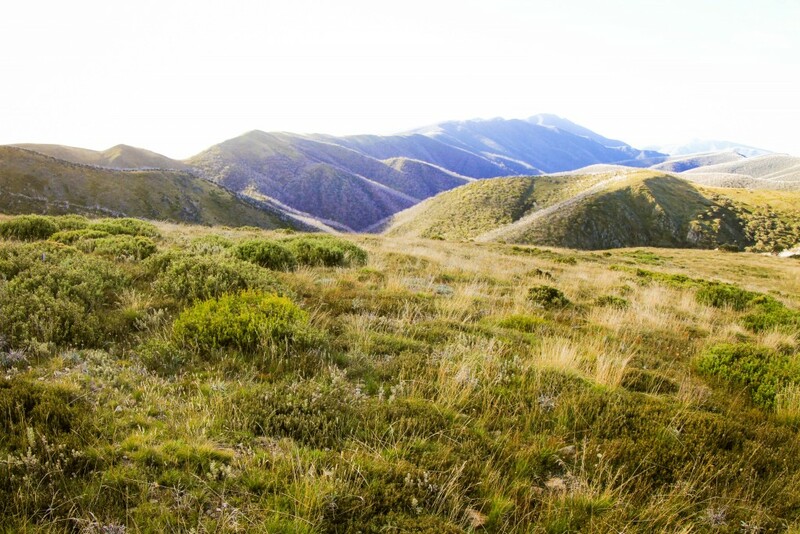 Tabletop walk (14km return) and the Mt Hotham to Dinner Plain Trail (13km one way). Dinner Plain has the Dinner Plain Hotel and a differing selection of Restaurants open depending on the time of the year. We had a nice brekkie one morning at the Dinner Plain Kitchen too. Out of season we recommend BYO groceries and supplies, as there is no where close if the supermarket isn’t open. So it was that it was cold and drizzling as we left Dinner Plain to make our way down to sunnier country and onwards home. Mt Hotham was 2 degrees and turning to sleet, utterly miserable, but bitterly spectacular, unbelievably an hour later we were sitting outside in the sun beer tasting in Bright at a toasty16 degrees. We loved the drive along the bottom of the valley, very gorgeous – the towns are all so cute and the scenery so beautiful at this time of the year. Harrietville wins the cutest ever town award – utterly gorgeous. Deep green, a sparkling creek, lots of autumn trees, cute cottages – not to mention the aforementioned local trout! We will need to come back as we only touched some beautiful places in passing. If you have the chance Rutherglen, Beechworth, Myrtleford, Bright and Harrietville are all worth a visit. We enjoyed our ‘prewinter’ Easter at Dinner Plain. It was so relaxing sitting by the fire after chilly walks. It was Indulgent being able to feast on such good local food, enjoy lots of chocolate Easter eggs and off course a few big Rutherglen red’s to wash down our Easter lamb.